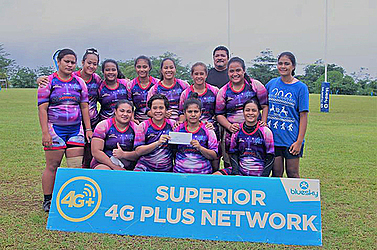 Apia Maroons have won the Bluesky National Women’s Sevens title. The five teams that competed include Apia Maroons, Aana Blues, Warriors, Aleipata and Lepea. Aana Blues claimed second overall with Warriors in third place. Tournament Coordinator and Samoa Rugby Union Development Officer, Avii Faalupega said the tournament is an opportunity for female players to be selected for the National Manusina Sevens team that will be preparing for the National Oceania’s Sevens Championship, which will be held towards the end of the year. “The whole purpose is to make sure that these girls progress, so that they could acquire a confirmed position the national team,” Avii said. She said there is a great need to recruit lots of skilled players. “We are still giving the opportunity to teams that will be joining us for the next two tournaments left so that everyone can get an equal opportunity to play,” Avii said. “We acknowledge Bluesky for their continuous support for our tournament due to our main difficulty faced at the moment, which is financial support. “Earlier this year we conducted programmes in schools for the sport of rugby just so we can develop the skills at a young age so that there is a guarantee of players for the future. “I think that the major barrier for women in rugby is the culture barrier. The mindset of our people for the roles of women in families and communities are still limited and no understanding of the talents these women have to offer,” she added.